By now you've probably heard that potato chips and french fries will kill you, right? 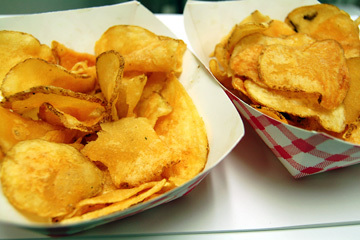 It all comes down to acrylamide, a carcinogen formed when heat and oil meet potatoes. So it's strange that one of the hottest snacks to come out of Kulia Grill, the cafeteria in the new John A. Burns School of Medicine -- which should have your health in mind -- happens to be thick-cut, crunchy potato chips cooked on the spot in rice bran oil. A friend of mine pooh-poohs any additional threat from substances in these killer potatoes. "It's the oil that will kill you," he says. "Any fried food is bad for you." Time will tell, and surely moderation helps, as in indulging your craving just once a month, and sharing a $1.50 basket. But for those who like to live dangerously, you know where to go! This week I'm breaking up with my television, as it's Turnoff TV Week. A bit melodramatic? Probably. But what good has ever come out of too much TV-watching? Though TV's been decent to me, piquing my interest with the occasional episode of "Lost," "Law and Order" or -- gasp -- "Survivor," this weekend's many activities make it a good time to turn off the box. Hit a craft fair and pick up a Mother's Day present (see Page 9), and get one for your favorite auntie, too. Take in a concert -- the Celtic Waves sound good (see Page 3) -- or just hang out with family. Don't cheat and take in a movie, though. That's just a bigger-screen TV. Detox is definitely on the come up, with a wide variety of parties in recent months. Check out "Le Poisson Rouge 1.5" on Friday for a mix of art and music. Explore, Suspicious Minds and My Ex Is Dead will perform, with Matt Kubo, Funkadugalon, Hawaiian Time Suspension and the Honolulu Underground Theatre Collective also in the house. On Saturday, "808 Ska Showcase" features Go Jimmy Go, Black Square, Golfcart Rebellion, Battle Royale and DJ Big Bar.